The Keystone project involves several different elements: the initial Keystone oil pipeline runs from Alberta to Illinois, in part utilizing existing pipelines, while the expansion (Keystone “XL”) entails extending pipeline all the way to Texas refineries and eventually the Gulf of Mexico (see adjoining map or see a more interactive map). Both lines will be able to move over around half a million barrels of oil per day. The original Keystone line is already finished, and the extension is expected to be completed in the next few years, provided that it receives the necessary agreement from the American government. This expansion phase, however, has been greeted by visible protest. This pipeline debacles speaks to many of the themes that I try to address in my research, which generally focuses on the history of transborder Canadian-American environmental issues. To this point, I’ve concentrated mainly on water (such as the St. Lawrence Seaway/Power Project and Niagara Falls), but there are many parallels between the history of transnational water and oil/gas pipelines projects. Earlier this year I began considering the history of Canadian-American transnational pipelines as a future research project (after a student queried the paucity of sources on such a topic). I found that little had been done from a historical perspective, aside of William Kilbourn’s book Pipeline; at about the same time, the public outcry about the Keystone XL grew, further piquing my interest. Let’s take a crash course in pipeline history. In the 1850s, the first natural gas pipeline in Canada, and perhaps the world, stretched some fifteen miles to Trois Rivieries. The world’s first oil pipeline was built between Petrolia and Sarnia in the 1860s, and after Confederation a pipeline system was stretched around the Great Lakes region. Before the end of the 19th century, Canada was already sending gas via pipeline into the U.S. (e.g. Detroit). It was soon discovered that the western areas held far greater reserves, and their exploitation – and concomitant pipelines – took off in the 20th century on both sides of the border. By the early Cold War, Canada and the United States had pipelines stretching across much of their respective countries. Technological advancements and further petro discoveries made the idea of the TransCanada pipeline feasible, and, in one of the great Canadian parliamentary controversies, legislation was passed in 1956 and the pipeline constructed in the following years. Since then, a vast network of transborder (state, province, and country) have proliferated in North America. 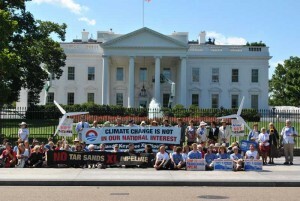 But if the Keystone XL pipeline is just business as usual, why is there so much resistance? In past pipeline disputes (e.g. TransCanada pipeline) there was certainly vociferous opposition, but it generally had to do with sectional, regional, political, and nationalist concerns. Many of those issues are at play in the current debate, but more than in previous cases, detractors are focused on environmental repercussions (see, for example, a New York Times editorial). In particular, opponents point out that, on top of the damage of the construction phase itself, pipelines inevitably result in spills and encourage the continual exploration and exploitation of oil and gas resources with their concomitant destructive effects, such as greenhouse emissions and global warming. For more detail on the impact of the tar sands, see Andrew Nikiforuk’s Tar Sands: Dirty Oil and the Future of a Continent as well as the tar sands aerial photography by Louis Helbig). American proponents argue that the pipeline will bring jobs and help the economy, and provide the U.S. with energy security. On top of environmental concerns, critics reply that the job boom will only be short-term, and that much of the oil will actually be exported outside of North America. The argument has been made that Canada is going to develop and sell oil anyway, and if the Americans don’t take the oil and the concomitant jobs, someone else will. 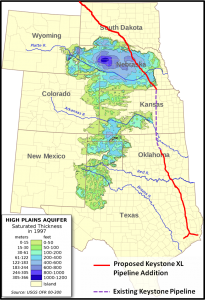 It is claimed that worries about leaks, including the potential threat to the Ogallala aquifer, are overblown. But leakage fears are justified. There have been many pipelines leaks and spills in past years – as Sean Kheraj has shown on his Nature’s Past blog in regard to Alberta spills – and perhaps the major 2010 Enbridge spill in Michigan (Enbridge also owns a transnational pipeline) is behind the increased resistance to the Keystone XL. And that is to say nothing of the horrendous BP Gulf oil spill. The history of resource development suggests that we take heed of the law of unintended consequences. It also shows that, even with environmental assessments, public input forums, and other checks and balances, the state and industry will continue to create environmentally destructive megaprojects to exploit natural resources because there is money to be made. But the long-term sustainability of the ecosystem outweighs short-term profits, even from a selfish perspective (e.g. more money won’t do much good if we don’t have clean water to drink). Canada has a dirty history when it comes to developing and exporting natural resources, from oil to asbestos. The Americans can choose not to take part in the Keystone XL project, but the reality is that both countries (and the developed world) are locked into patterns of fossil fuel dependency, and it is going to take a long time and a lot of effort to change. Unless fundamental structural transformations are made, the view that these sorts of things are going to happen anyway has a lot currency, both metaphorically and tangibly. Daniel Macfarlane is a SSHRC postdoctoral fellow at Carleton University. He is finishing a book, based on his doctoral dissertation, titled To the Heart of the Continent: The Creation of the St. Lawrence Seaway and Power Project. He is widely interested in Canadian-American environmental relations, and is also conducting research on the transborder manipulation of Niagara Falls and co-editing a collection on the history of Canadian-American water relations. Excellent post, Dan. I wondered how the Mackenzie Valley Pipeline controversy in the 1970s compares to the Keystone XL debate today. Any thoughts? Also, since you mentioned asbestos in your post, I thought readers should know that @ehtvcanada will be posting the final video in its five-part mini-series of asbestos mining in Quebec tomorrow. That’s a great question Sean. I should have mentioned the MVP in the article. Without knowing as much as I’d like to about the MPV, it appears that the stalling of the project out of concern for those impacted, although with less concern about the environment and probably no concern about climate change, might be a similarity (which, come to think of it, might undermine my point in the AH article about Keystone opposition representing a potential tipping point). With the MVP, it goes through less populated lands and the First Nations directly impacted were given partial ownership (bought off? ); with the Keystone, it will traverse territory with higher populations and many of those it may impact don’t stand to gain directly from the pipeline’s existence. Your thoughts? I think the MVP case might be very instructive for thinking about the current Keystone XL debate (perhaps a future AH or The Otter post?). MVP was certainly different in terms of the density of affected populations, but I think that environmental disturbance was still a central component of the opposition, especially concerning wildlife habitat for northern Aboriginal peoples. I think the primary difference would be the transnational dimension of the Keystone XL pipeline plans. Any research or thoughts off the top of your head on how terrorists could use pipelines to blow up Canada or the parts of the USA that have pipelines?